This BABY jsk and headdress are simply majestic.--I ship anywhere. Shipping, feedback, and size are in the Main Description. 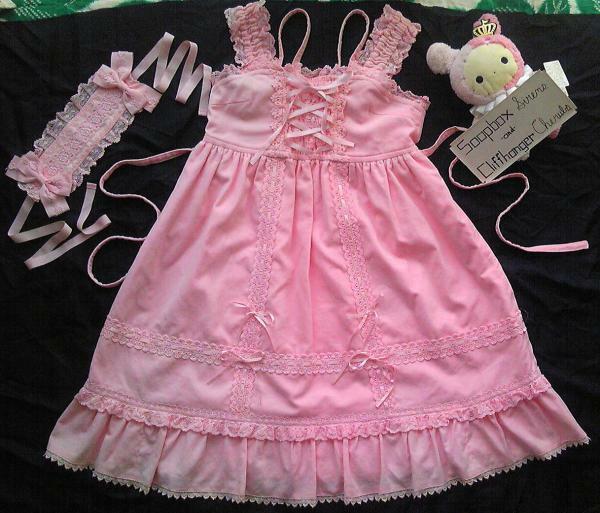 -BABYtssB Babydoll Velveteen Jsk: The jsk is a soft pink. It has five types of lace, and I like the four bows at the cross sections of lace in the front. The jsk neckties aren't detachable. I found a reference link for it (http://www.wunderwelt.jp/products/detail8256.html). I am the first owner of the jsk. Its condition is Very Good/Like New. -BABYtssB Velveteen Headdress: I bought this headdress at the same time as the dress. This headdress has four types of lace. My favorite features of it are the bows on either side which have rose lace stitched onto them and the rose lace across the length of the headdress. Condition: Like New. Please feel free to contact me if you have any questions! I am happy to help!